Chalk this DIY up to one of the most random projects we’ve ever done in the name of saving a buck. We have two wood burning fireplaces we do not use. We could, but for a variety of reasons, we really like our forced-air gas furnace. We considered getting a fireplace door or screen installed, but didn’t want to do anything permanent and we like the open look of the fireplace. The good news is the balloon should also be designed to shrink and burst should you accidentally light a fire in the fireplace. The fireplace gases would be able to escape thereby preventing a really dangerous situation from occurring. My DIY chimney plug does not have this failsafe. I would need to take care to remove the plug before I move out so that someone doesn’t unknowingly start a fire in one of the fireplaces. Among the many DIY options we found on the Internet, one involved stuffing a bag of blown-in insulation up into the chimney. Another one used rigid styrofoam insulation board cut to size and fitted into the space. I should say at this point that I am NOT a fireplace or heating and cooling expert. Do your own research and find a solution that is safe and effective for you. We created a hybrid solution. We did stuff something up the chimney, but it wasn’t insulation. It was all of the old throw pillows I’d been saving. I KNEW they would come in handy! In the research we did, this solution seemed to work for other people and we figured we would try it first before buying insulation or the balloon. After all, the price was right. FREE! You can’t use regular garbage bags for this, you need construction grade garbage bags that are tough enough to not tear when you force them up the chimney. My husband stuffed a bag with a whole bunch of pillows and tied it up. Now comes the dirty part. 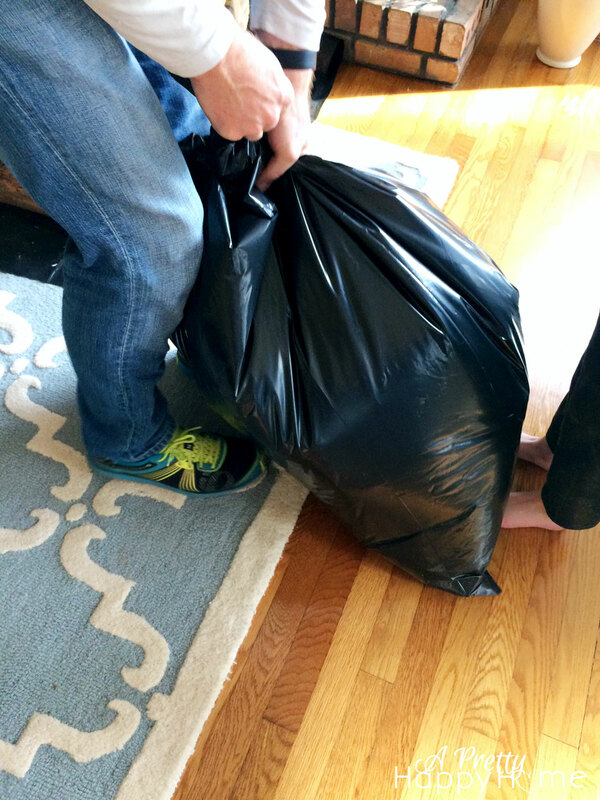 My husband basically shoved the bag of pillows as far up in the chimney as it would go – until it got stuck. This means he was standing up inside of the chimney. I don’t know when our chimney was last cleaned or even inspected to see if it’s safe. There’s a reason why chimney sweeps recommend annual chimney cleaning! Safety goggles and old clothes were a must. My husband was covered in soot. COVERED. He wouldn’t let me take a picture of that. Party pooper. It’s been about a month since we did this DIY, so I don’t have any financial results to report on yet. I can tell just by standing in front of each fireplace that air is not drafting in and out any longer. The bag in the dining room fireplace has not budged, but we did have to shove the bag in the living room fireplace up once after it slipped down. So far, it is defying gravity and staying put the second time around. I’m curious to see how this works out long term. I love a good experiment and I’m happy we saved $140. I’ll be even happier if our heating bill goes down! P.S. Remember, I am not an expert on these things and I’m only sharing what we did in fireplaces we were not using. I am not recommending this solution. It could be incredibly dangerous if a fire was lit in a fireplace with a chimney that was blocked in any way. Please do your own research, consult the real experts and find a solution that is right and safe for you. Thank you, thank you, thank you. If you liked this post, you may find these up your alley too! Since it’s been a year, I’m just wondering how this worked out for you. We’re thinking about doing something similar. Hey! Was it an inelegant solution? Yes. But it was also a totally cheap solution that definitely blocked that draft. So, it definitely worked. We applied the DIY trick to both fireplaces and we only had to re-shove the bag up in one of the chimneys once. I will say, you need to make sure nothing can get down your chimney – a chimney should have some sort of cap on it to prevent the weather (or birds) from coming in. Also, and I do feel like I should stress this, it’s not the safest solution. If someone forgets there is a DIY chimney plug in the chimney and lights a fire, that could be really bad. The plugs you can buy at Home Depot or Amazon are designed to pop/release if a fire is lit in the fireplace. So definitely don’t move or rent your house out on AirBnB without telling people to not use the fireplace! Hope that helps.